Crisp and crunchy cucumbers are great in a salad or as a DIY spa treatment, but there are more reasons why you should always have a few in your crisper. Cucumbers are rich in potassium, which has been shown to help lower blood pressure, and vitamin K, which is essential for calcium absorption and bone health. Cucumbers also contain fisetin, an anti-inflammatory substance that plays an important role in maintaining cognitive function. What is more, cucumbers can help lower the inflammatory response in the body and reduce the risk of certain cancers and cardiovascular diseases. They also happen to be delicious. From vibrant salads to spicy stir-fry, here are nine ways to take advantage of the cucumbers' potential health benefits. Instead of serving cucumbers cold, try this tangy stir-fry featuring mushrooms spiced with ginger, garlic and jalapeño. This salad celebrates the humble cucumber in its raw and pickled state. 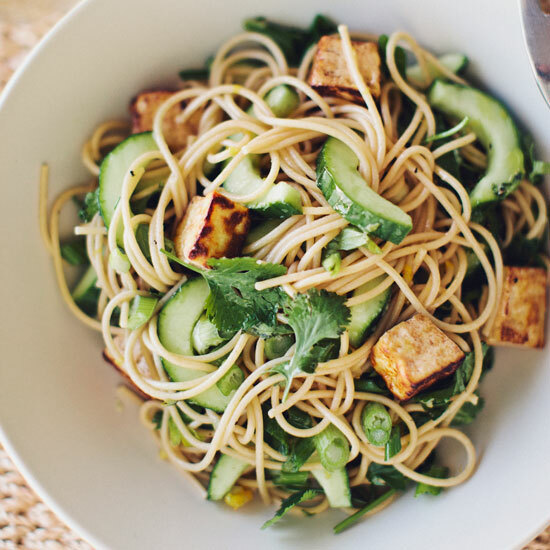 This fast pasta salad is reminiscent of Japanese soba-noodle dishes. Cucumbers combined with sugar, salt, red wine vinegar and thinly sliced onion make a supereasy, delicious side dish. Chef Paul Qui's light crêpes are filled with a crisp and refreshing julienned salad of cucumber, carrot, daikon and green mango. This terrific take on fried rice features cucumbers, salami and arugula. Chef Bill Kim marinates these cucumbers for just two hours, so they're still crisp. These incredibly simple pickles have just the right amount of garlic and dill. Olive oil-marinated cucumbers are fantastic served with this airy feta spread. This refreshing, unsweetened cocktail makes a great digestif.